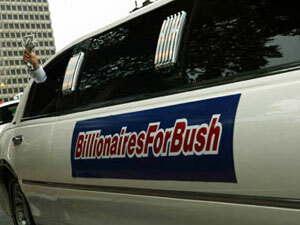 During the election in 2004, Bush got support from a hundreds of billionaires who would come to rallies wearing their tuxedos, sleek gowns and pearls. As is turned out, however, they were not real billionaires but a group of anti-Bush activists who had created an exciting way to protest. Carrying signs with slogans such as ‘It’s a class war and we’re winning’, ‘We’re selling your future today’ and ‘Widen the income gap’, they employed irony to criticize the pro-rich policy of President Bush. Participants also adopt playful names such as Mo Bludfer Oyle (more blood for oil) and Robin D. Poor (robbing the poor). Founder Andrew Boyd is known as billionaire Phil T. Rich. 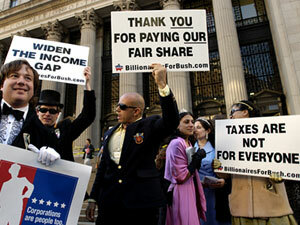 On one occasion the billionaires visited a rally were Karl Rove would be speaking. Rove is seen by many as the brain behind Bush, the man who masterminded the success of the Bush campaign. The billionaires, who were carrying seemingly pro-Rove signs, were initially greeted warmly by the crowd that had gathered. The security guards and police however knew that the billionaires weren’t real and asked them to step back as Karl Rove arrived in his limousine with a “trophy” wife. They went up to Rove and warned him against the protesters in disguise. 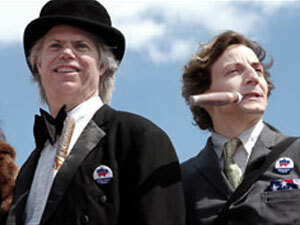 Then, suddenly, Karl Rove arrived in his limousine! After a few confused moments it turned out the first Karl Rove wasn’t real… actually he was a lookalike from the Billionaires for Bush.